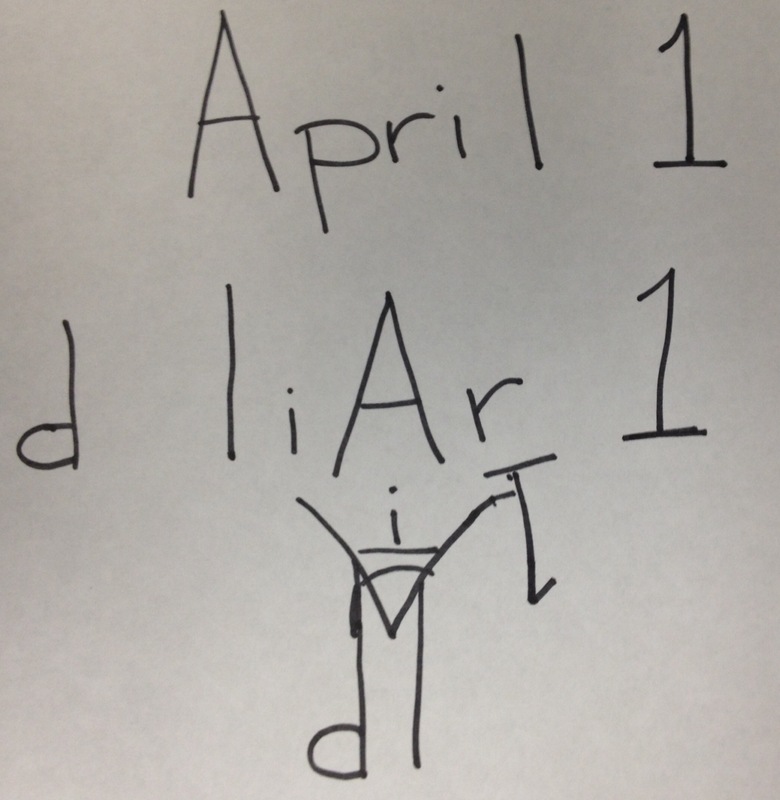 Using clear discernment, one can see that in writing April 1 can be easily rearranged to mean “d liar 1” or create a clear image of an evil being with a “one” shaped pitchfork. *Note: A similar version of this post appeared simultaneously at ABPNews Blog. Child 1: Hey, Triphony (name invented to protect the young), guess what? Child 1: (a long pause, followed by laughter) April Fool’s! What foul trickery is this, that one such little babe, this very one who is said to resemble the necessary state of character as to be required for entrance into the kingdom of God, would, by means of deception, seek to ridicule another child? Have they not heard of Jesus’ teaching on both lying (as made famous by my favorite childhood song “Revelation 21:8″) and on calling a fellow a “fool”? And so, like any good follower of the ways of the Scriptures, I proceeded to show them the error of their ways, seeking by all means necessary to convince them that this foul day, this April 1st, was not a day of jocularity but a day in which the arts of deception and mockery are valued above all others. It is a liar’s holiday. While they were caught unawares by this abundance of new information, I felt compelled to make sure people knew of its dastardly origins and practices. The first sign that April Fools need be cast from our practices like a witch out of the colony is simply that it does not have a biblical basis. Nowhere in the teachings of either the Hebrew Scriptures or the New Testament does the mention of a “free liar’s pass day” occur. What is more, there is not even any mention of the month of April. Perhaps it is best we do away with this entire month. What we do find in the tomes of the Pedia of Wiki is that most likely April Fool’s day was begun by an error in the writing of Chaucer’s Canterbury Tales. That we would take instruction from an error is reprehensible, but that we would take instruction from such a tawdry piece of writing as these tales is indication that we have been tainted by an evil touch (and anyone who has seen the documentary A Knight’s Tale knows that Mr. Chaucer was no champion of the Christian virtues). In the light of the day, may we not be those “who know not what they do” in regards to this evil holiday. The crusades of our faith require constant vigilance and purity of heart. And so, while I applaud my brothers (and sisters, but mostly it seems like brothers) who have taken upon them the heavy burden of fighting against the tyranny of the liberal agenda, the Disney corporation, World Vision, Target, Canada, Harry Potter, Yoga, Yoga Pants, and all these new-fangled Hindu Runs of the Color, I am afraid that they are missing the silent thief who has snuck into our fold and captured our minds with the wiles of Satan – April Fool’s Day. How else might we explain the rise in duplicity that has been seen in the leaders of the free world. Surely before the 16th century leaders were noble and only interested in the welfare of their constituents? Surely all this web of lies is not the fault of good meaning leaders, but the work of the evil one who has snuck through our defenses annually on this first day of April. And so, with your hearts and minds full of new revelation, the time has come for action. I urge you with all that is within me to use all that is within you to rise above the temptation found on this day and declare it for the falsehood it is. Indeed, “go the extra mile” as you have been told, and stop celebrating the month of April entirely, because surely Jesus joketh about giving unto Caesar.